deutscher Maler des Expressionismus. Er beteiligte sich an den beiden Ausstellungen des Blauen Reiters (1887-1914). A.L.S. „Dein Sohn August“. Paris. 8vo. 3 SS. Dazu 1 S. Nachschrift seiner Frau Lisbeth. 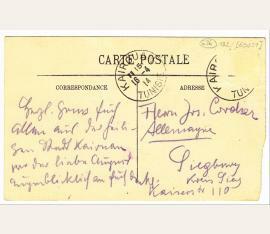 From his honeymoon in Paris addressed to his mother in Siegburg with late birthday greetings. On their trip via Frankfurt, Colmar, and Bern, the young couple was accompanied by their friend, the painter Louis Moilliet: “[…] With all the fuss here in Paris, I have nearly forgotten your birthday. Even my wife, who normally thinks about this sort of thing, did not remember it, until just now. We have looked at each other in surprise realizing that the 16th is already past. The birthday letter for a dear mother by her loving son, however, will be early enough as it is. You will be surprised to learn that we are now in Paris. We decided this quite quickly: M. Moilliet is this accompanying us. We get along very well. Now, three days ago, Walter arrived, and yesterday, Artur came too. Isn’t that wonderful! We are staying in a family hotel called ‘Lisbeth’ (full pension). All is excellent. We are considering staying here for the whole time since it is just so beautiful. Besides, I have met a painter through M. Moilliet who is extremely good and to whom I loo up. It is not sure, but quite likely that we will stay here. There really is no other city like Paris if it comes to living and painting. I think, Lisbeth has enjoyed herself, too. Only Walter has been telling us about the rest of the wedding, which seems to have been quite nice. We have been to Frankfurt, Colmar, Bern. In Bern, we have had a great time with Ms. Moilliet, wife of the colonel.” – Starting in October 1908, Macke had been in military service, a fact that had almost completely interrupted his artistic production. In October 1909, after having finished his military service, he married Elisabeth Gerhardt. The revenue Elisabeth got from her father’s legacy ensured their living. Thus, they were able to live comfortably, albeit not in luxury. IN 1910 and 1913, their sons Walter and Wolfgang were born. Their honeymoon led them to Paris, where Macke saw paintings by the Fauves and the Futurists. After that, by the end of October, the couple moved to Tegernsee, where Schmidtbonn had invited them. The following year, spent in the quiet solitude of Upper Bavaria, turned out to be one of extreme productivity..
deutscher Maler des Expressionismus. Er beteiligte sich an den beiden Ausstellungen des Blauen Reiters (1887-1914). A.L.S. „August“. Tegernsee. 8vo. 3 SS. To his sister Auguste in Kandern, who had asked him to stand surety: “[…] First, we do not know enough about our assets to be able to stand security. Second, signatures have fooled you and Ottilie enough, and Mom as well. Third, our assets are closely related to our business, so we cannot possibly figure all this out. You are sending me two small pages and one leaf, which is all double Dutch to me. Even if there is no risk at all, you cannot ask someone who is totally uninformed to sign something. After all the trouble that signatures have caused our family, I have sworn not to sign anything at all ever again. Especially since I don’t think I have the right to do it since I – unlike you – do not earn my own money. Apart from that, didn’t you write that grandmother and Eugen would stand surety? Please don’t hold this against us. We just don’t know anything about business matters and only live by what we get without caring about anything else, the reason of which is total ignorance of business matters. I suppose you will understand that. […] Please don’t write to the Gerhardt family, either. I don’t want this. So no offence, please.” – Starting in October 1908, Macke had been in military service, a fact that had almost completely interrupted his artistic production. In October 1909, after having finished his military service, he married Elisabeth Gerhardt. The revenue Elisabeth got from her father’s legacy ensured their living. Thus, they were able to live comfortably, albeit not in luxury. IN 1910 and 1913, their sons Walter and Wolfgang were born. Their honeymoon led them to Paris, where Macke saw paintings by the Fauves and the Futurists. After that, by the end of October, the couple moved to Tegernsee, where Schmidtbonn had invited them. The following year, spent in the quiet solitude of Upper Bavaria, turned out to be one of extreme productivity..
deutscher Maler des Expressionismus. Er beteiligte sich an den beiden Ausstellungen des Blauen Reiters (1887-1914). A.L.S. „August“. Tegernsee. 8vo. 4 SS. To his sister Auguste and his brother in law Karl (Giss) in Kandern. 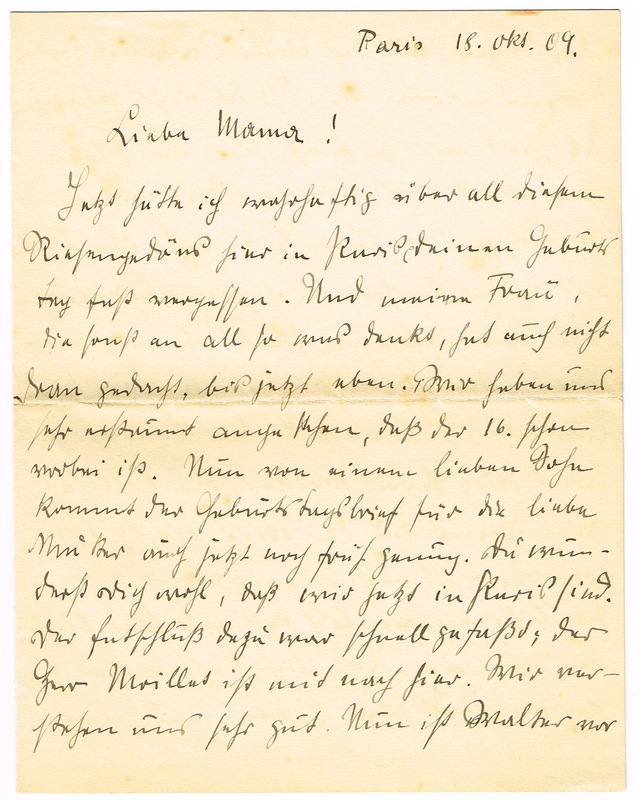 Macke tells them that he and his wife have decided to transfer the sum of 1700 Mark, a loan from Auguste, to his other sister, Ottilie, and her husband, Josef Cordier: “We have wonderful weather here, everything is covered in snow, which makes me really happy, especially since I have just lost one worry. 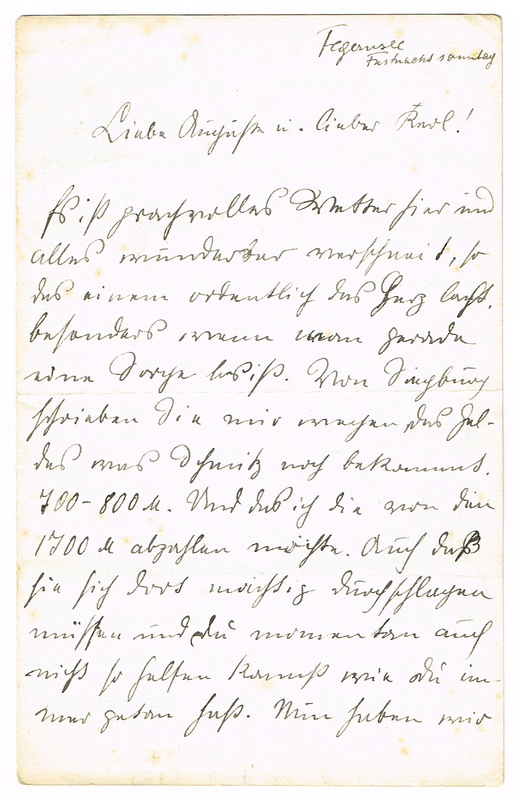 Those in Siegburg [i. e. Ottilie and her husband] have written me about the money they owe Schmitz, a sum of 700–800 Mark, asking me to pay the money off the 1700 Mark. They tell me they have a lot of money issues and that you cannot help them either at the moment. […] All the trouble always originates in money, which is so stupid. Ultimately, it is not worth thinking about it. Apart from that, we are well. I keep painting.” Macke also tells them that “uncle Bernhard” (the collector and patron of the arts, Bernhard Koehler, his wife’s uncle) has invited his cousin, Hellmuth Macke, to come to Berlin. – Starting in October 1908, Macke had been in military service, a fact that had almost completely interrupted his artistic production. In October 1909, after having finished his military service, he married Elisabeth Gerhardt. The revenue Elisabeth got from her father’s legacy ensured their living. Thus, they were able to live comfortably, albeit not in luxury. IN 1910 and 1913, their sons Walter and Wolfgang were born. Their honeymoon led them to Paris, where Macke saw paintings by the Fauves and the Futurists. After that, by the end of October, the couple moved to Tegernsee, where Schmidtbonn had invited them. The following year, spent in the quiet solitude of Upper Bavaria, turned out to be one of extreme productivity..
deutscher Maler des Expressionismus. Er beteiligte sich an den beiden Ausstellungen des Blauen Reiters (1887-1914). A.L.S. „August“. Tegernsee. 8vo. 3 SS. Dazu eine 1 1/4 seitige Nachschrift seiner Frau Elisabeth Macke. To his sister Ottilie and his brother in law Hubert in Siegburg. 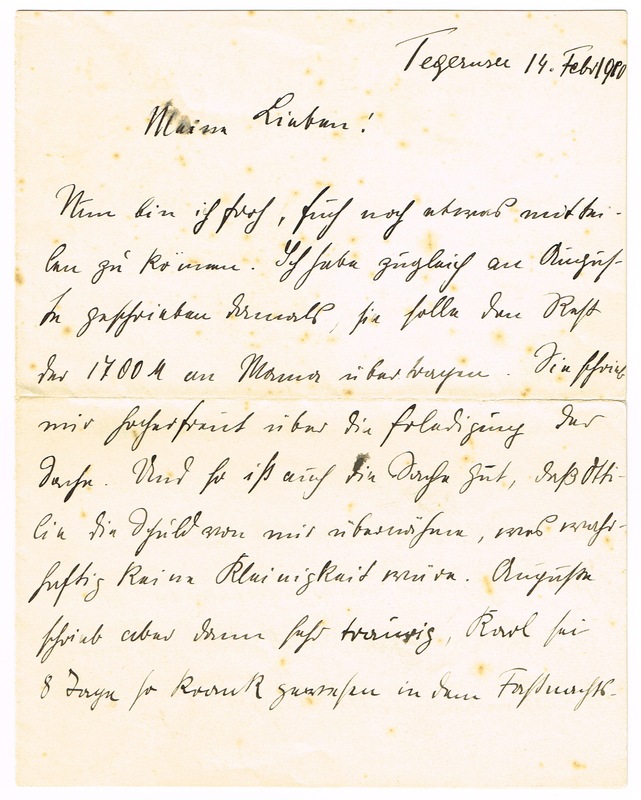 Macke is relieved because of “the thing” in Siegburg, referring to the transfer of the 1700 Mark to Ottilie, a sum that his other sister, Auguste, has borrowed him: “[…] Probably, it will get warmer soon, so we will need less fuel. I still like it very much here; it is so calm and secluded. We also have a cat, which adds a lot to the coziness. 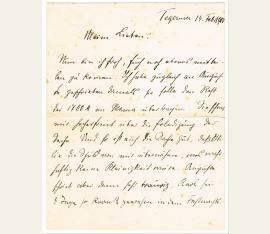 […]” Elisabeth continues by recounting her idyllic life and activities in Tegernsee. – Starting in October 1908, Macke had been in military service, a fact that had almost completely interrupted his artistic production. In October 1909, after having finished his military service, he married Elisabeth Gerhardt. The revenue Elisabeth got from her father’s legacy ensured their living. Thus, they were able to live comfortably, albeit not in luxury. IN 1910 and 1913, their sons Walter and Wolfgang were born. Their honeymoon led them to Paris, where Macke saw paintings by the Fauves and the Futurists. After that, by the end of October, the couple moved to Tegernsee, where Schmidtbonn had invited them. The following year, spent in the quiet solitude of Upper Bavaria, turned out to be one of extreme productivity..
deutscher Maler des Expressionismus. Er beteiligte sich an den beiden Ausstellungen des Blauen Reiters (1887-1914). Eigenh. Fotopostkarte m. U. Truppenübungsplatz Elsenborn. Quer-kl.-8vo. 1 Seite. The postcard shows a track of marching reservists, rifles shouldered. 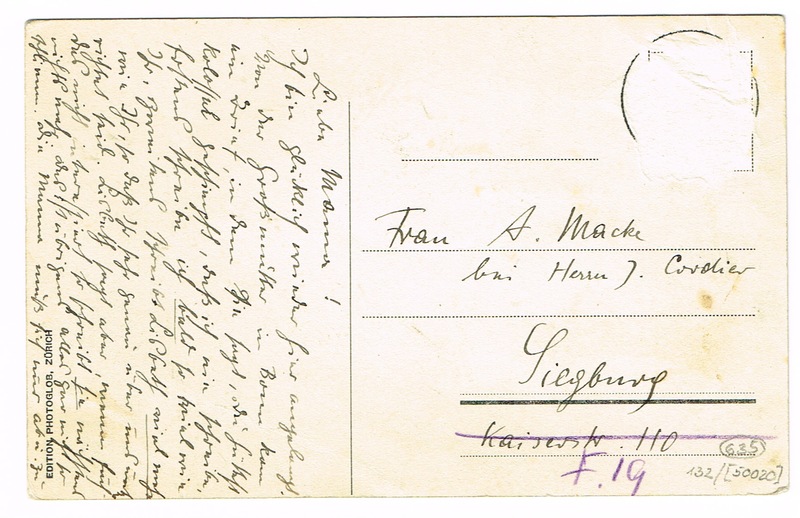 Macke is marked by the handwritten number 735. 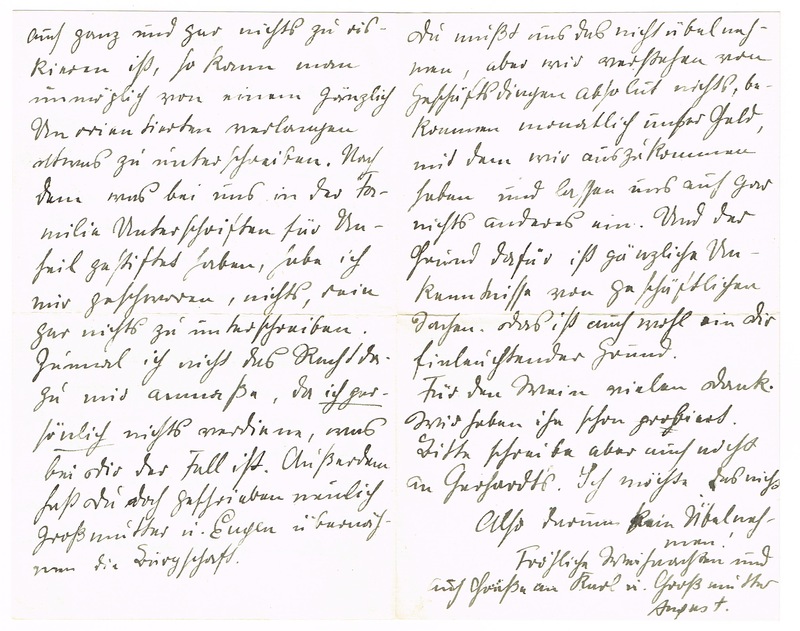 To his mother in Kandern: “[…] I have arrived here very well. I like it a lot, against expectation. The landscape is as beautiful as up on the Feldberg. There is wonderful honey. So everything is great […]”. In August 1912, Macke took part in an exercise for the reserves in Elsenborn (today: Belgium). deutscher Maler des Expressionismus. Er beteiligte sich an den beiden Ausstellungen des Blauen Reiters (1887-1914). Autographed portrait „August“. Truppenübungsplatz Elsenborn. Quer-kl.-8vo. 1 Seite. Photograph of a group of officers and corporals., in the middle August Macke, in the background troops. To his mother in Kandern: “[…] For eight days we have now been going around in the rain with God for the King and the country. Liters of water in the boots. But I am standing up. Not even a cold. […]”. 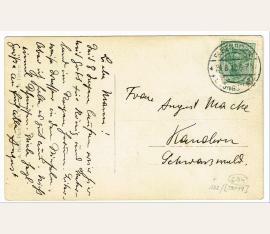 – In August 1912, Macke took part in an exercise for the reserves in Elsenborn (today: Belgium). deutscher Maler des Expressionismus. Er beteiligte sich an den beiden Ausstellungen des Blauen Reiters (1887-1914). A.P.S. „Dein lieber August“. [Hilterfingen am Thunersee, nach November 1913, Anfang Mai 1914?]. Quer-kl.-8vo. 1 1/4 SS. 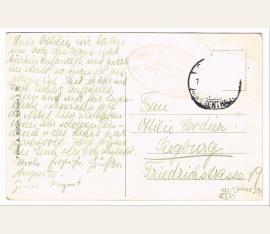 Briefmarke mit Poststempel entfernt. Bleistift. deutscher Maler des Expressionismus. Er beteiligte sich an den beiden Ausstellungen des Blauen Reiters (1887-1914). Eigenh. 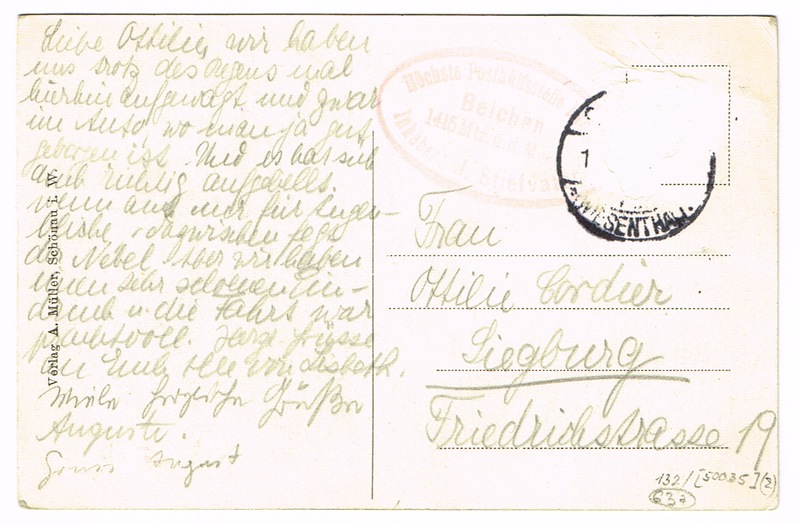 Bildpostkarte mit Namenszug im Text „der liebe August“. Kairouan, Tunesien. Quer-kl.-8vo. 1 Seite. Bleistift. Frankatur entfernt. To his brother in law Josef Cordier in Siegburg. 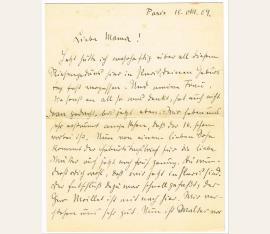 “Many greetings to all of you from the holy city of Kairouan, where your beloved August thinks of you right now.”- Im April 1914 wurde der Aufenthalt durch eine gut vierzehntägige Reise gemeinsam mit Paul Klee und Louis Moilliet nach Tunesien unterbrochen. Die Reise kam auf Betreiben von Klee zustande. Dieser wünschte sich eine Studienfahrt, auf der die Maler sich gegenseitig anregen sollten. Macke kam von dieser Reise mit einer Fülle von Fotos, Zeichnungen und Aquarellen zurück; einige davon benutzte er in Hilterfingen bzw. später in Bonn als Grundlage für Gemälde. In der zweiten Junihälfte kehrte das Ehepaar nach Bonn zurück, wo August Macke sechs Wochen intensiver Arbeit blieben. Bei Ausbruch des Ersten Weltkriegs meldete sich Macke freiwillig an die Front und wurde am 8. August 1914 zum Infanterie-Regiment Nr. 160 eingezogen. Er fiel am 26. September 1914 im Alter von 27 Jahren als Offizierstellvertreter an der Westfront bei Perthes-lès-Hurlus in der Champagne. 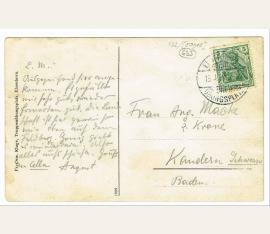 Seine Briefe aus dem Feld stehen unter dem Eindruck der Schrecken und der Grausamkeit des Krieges. Macke ist auf dem Soldatenfriedhof von Souain begraben. 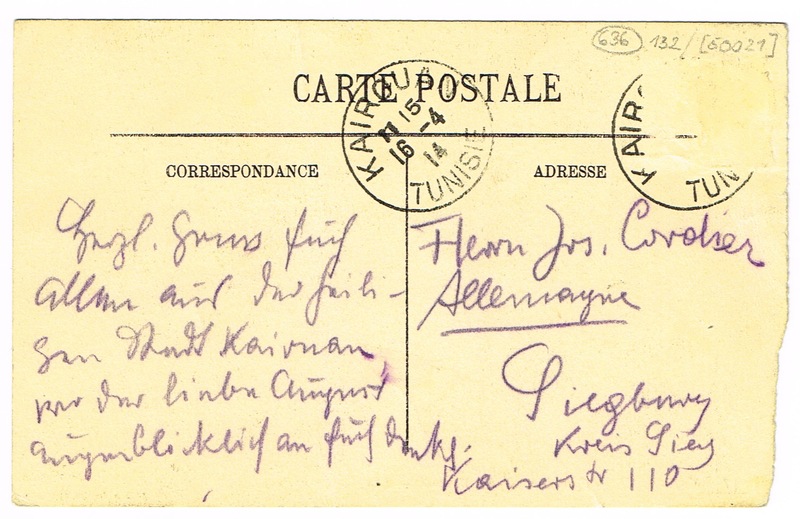 - Die Postkarte zeigt eine Fotoansicht von Kairouan, Cour de la Grande Mosquée..
deutscher Maler des Expressionismus. Er beteiligte sich an den beiden Ausstellungen des Blauen Reiters (1887-1914). 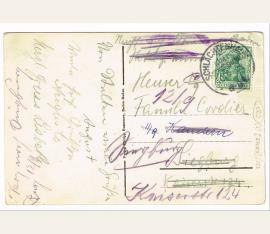 Signature on a picture postcard „Gruss August“. o. O. [Schwarzwald]. 8vo. 1 Seite. To his sister Ottilie and his brother in law Josef Cordier in Siegburg, sending greetings from the Black Forest. 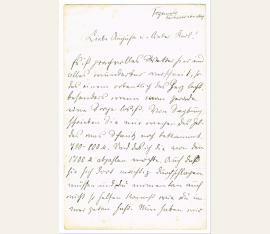 The card is written by his sister Auguste and signed by August Macke. deutscher Maler des Expressionismus. Er beteiligte sich an den beiden Ausstellungen des Blauen Reiters (1887-1914). Eigenh. Feldpostkarte m. U. „August“. Westfront. 8vo. 1 Seite. Bleistift. (Schwach gebräunt). Walter describes him as “sad”. 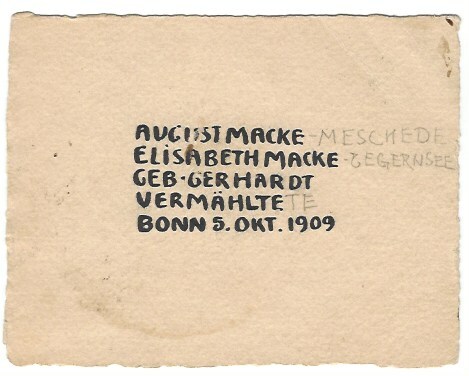 In his letters and postcards to Elisabeth, Macke himself uses words like “dreadful”, “horrible”, “awful”, “terrible” and “the most gruesome experience a man can undergo”. He suspects that his chances of surviving are minimal: “I would consider myself incredibly lucky if I was to return from this war. I think about all the beautiful things that I have witnessed and that I have you to thank for”. Apart from being horrified about the losses on the German side, he also shows compassion considering the injured or killed French soldiers. We do not have any political comments by Macke. 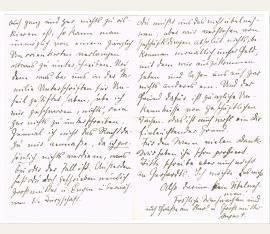 Elisabeth reports: “Something that bothered him a lot causing a grave mood were encounters with French officers in Tunis [April 1914] who considered an imminent war with Germany possible.” Macke has often been abroad, especially in France, and the general German chauvinism towards the “hereditary enemy” seems not to have affected him. On September 20 he is rewarded the Iron Cross Second Class, which he sends home immediately. 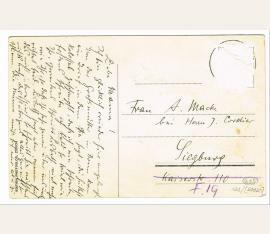 His last postcard dates from September 24; in it, he asks for chocolate, warm socks, clothes, and cigarettes. On Saturday, September 26, German troops attacked French positions south of Perthes-lès-Hurlus. On this occasion, August Macke was killed. 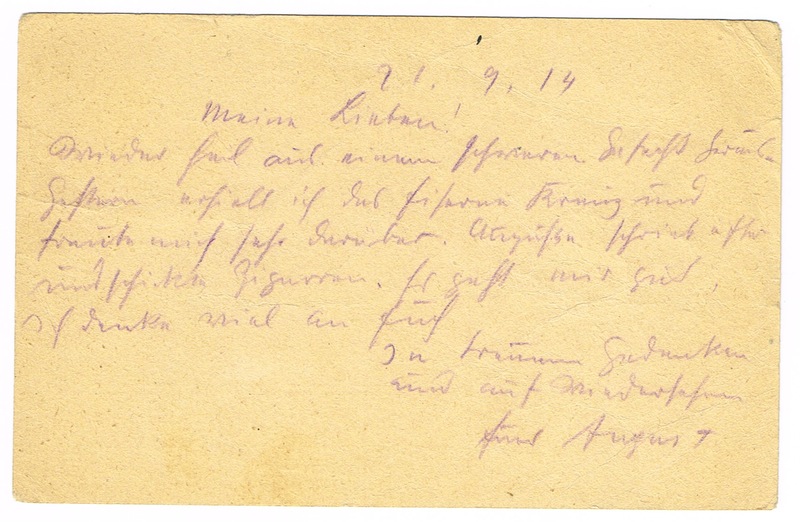 – In one of his last testimonies, Macke tells his brother in law about the front: “[…] My dearest ones! Safe and sound, I am back from a heavy battle. Yesterday, I got the Iron Cross and I am very happy about it. 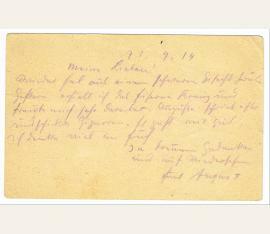 Auguste has written several times sending cigarettes. I am well and I think about you a lot. Faithfully goodbye, August […]”. deutscher Maler des Expressionismus. Er beteiligte sich an den beiden Ausstellungen des Blauen Reiters (1887-1914). 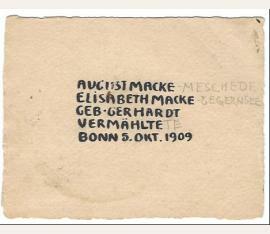 Macke’s Wedding Announcement with a small male portrait on the verso. Bonn. Büttenkarton, 90 : 115 mm. 1 Seite. Black China ink and pencil in Macke’s nice calligraphic hand: “AUGUST MACKE | ELISABETH MACKE | BORN GERHARDT | NEWLYWED | BONN OCT. 5 1909”. – Verso a male portrait [Auguste’s husband, Josef Cordier], bust portrait in profile. E. Namenszug „August“ auf einer Ansichtskarte. A note to his family. 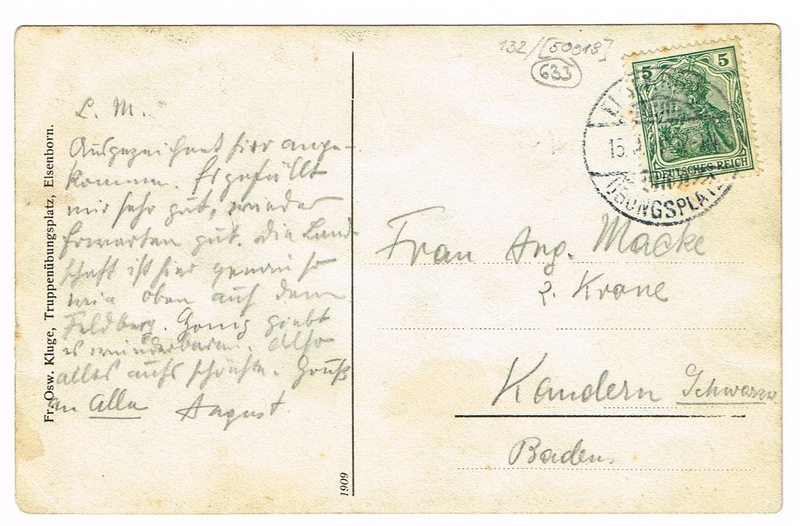 In part (translated): “Greetings from Stalten.” Postcard bears additional pencil notes and several strikethroughs and emendations to the address area. In fine condition. 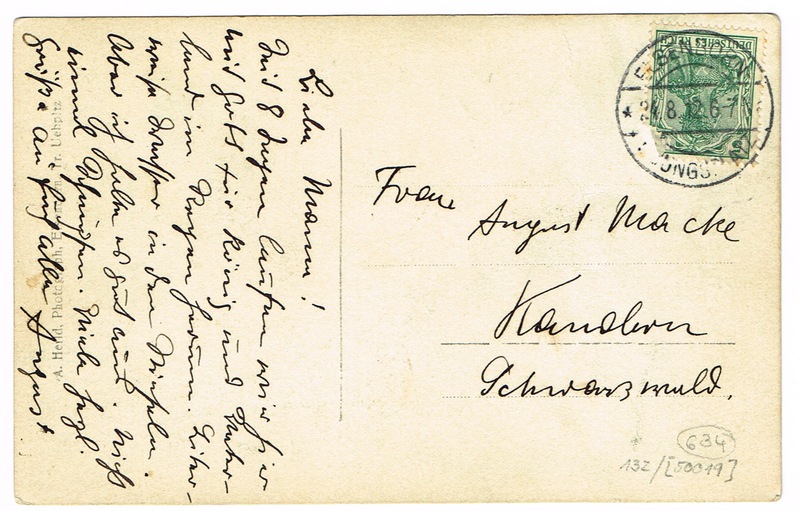 The period he sent this postcard marked the beginning of the height of his career, during which he developed his distinct style by integrating several of the avant-garde movements.